The old Baptist hymns still stir me and bring tears to my eyes. 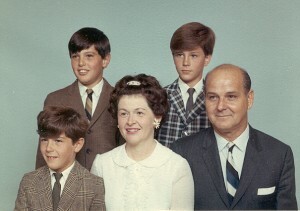 They take me back to my childhood when the family would dress up, us kids in our little suits with cheesy ties and short-legged pants (I’m the one in the plaid jacket). 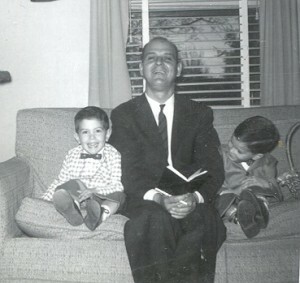 Dad would always give us candy during the service and put his arm around us while tickling our ears. The good old days. Dad used to tear up at the old hymns. As he lay in his bed dying a few years ago we put the Bill Gaither Trio (YouTube) albums on the iPad I bought him. He would listen to the classics over and over again. I think he could already see the Lord and was ready to go. Sunday we sang two of those old classics at Mass. I looked over expecting to see my dad and mom sitting their in their 50’s suit and dress, smiling as their three boys fidgeted in the pew waiting to back to our ponies and swimming pool. Yeah, I had tears running down my checks. When I got home I called my brother Tim. He said he cannot even sing those hymns at Mass without choking up and the words stop coming. Mom and Dad were the best; those old Baptist hymns are surely sung in heaven and I have fond and loving memories on my Baptist upbringing. The hymns from last Sunday were “What Can Wash Away My Sins, Nothing but the Blood of Jesus” and “How Great Thou Art” (YouTube video). Put the hymnal away — I can sing those by heart and from my heart. I still sing them with my mom who still love them and with dad who is surely watching from heaven — still praying for his boys. Having been born and raised Methodist and converting to Catholicism 9 years ago, I definitely know what you mean. There are certain hymns that deeply resonate and transport me to another time. We sang “What Can Wash Away My Sins” and “How Great Thou Art” at the Sunday at 5:00 Mass at St. John’s in Ypsi this weekend. You weren’t there too were you? I remember a Calvary Chapel of Costa Mesa service where Dennis Agajanian (www.dennisagajanian.com/) did a bluegrass version of Nothing but the Blood of Jesus. Wonderful piece that was. Steve, God bless you for your appreciation for a truly glorious tradition that Protestantism has given to Christendom. 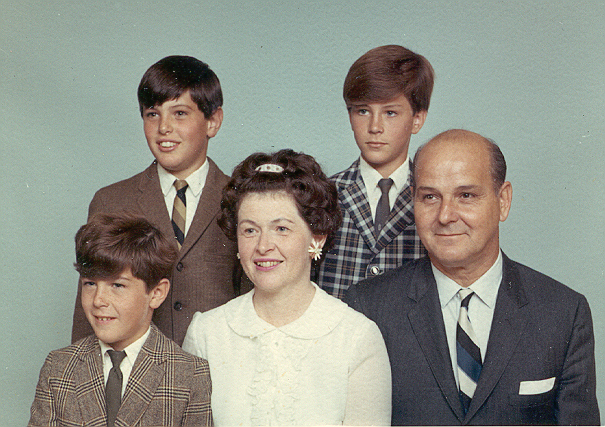 I also was raised Protestant, and if my family and I were not members of an evangelical Baptist congregation, we were evangelical fundies of some stripe. However, praise be to our God, I was called home to the Church and the fullness of faith in Jesus Christ in May 2013 at the age of 28. Still, I share your gratitude that American evangelical congregations, mostly drawing their roots to the Second Great Awakening, have taught all of the Christian world a very beautiful form of music-based worship. My favorites are “Leaning on the Everlasting Arms,” “To God be the Glory,” “Stand Up, Stand Up for Jesus,” “On Christ the Solid Rock I Stand,” and “Standing on the Promises of God.” The theme of standing is prevalent throughout my favorites, as you can see. When I got married in the Roman Catholic church 5 years ago, i was informed by the parish priest to make a list of available hymns the choir should sing at the wedding mass for approval. Some of them are mentioned in the posts above. Some were accepted while many were “rejected” outright as I was told it contradicted Roman Catholic doctrine. I was truly sad. There are SO many wonderful, theologically sound old protestant hymns and yes, i can sing all verses of almost every one without a hymnal. My dad was a Wesleyan pastor and I converted in 1993, never to look back EXCEPT wishing we could sing these wonderful hymns at mass. Our local Nazarene church has a hymn-sing the last Sunday night of every month, and I attend and sing my heart out!